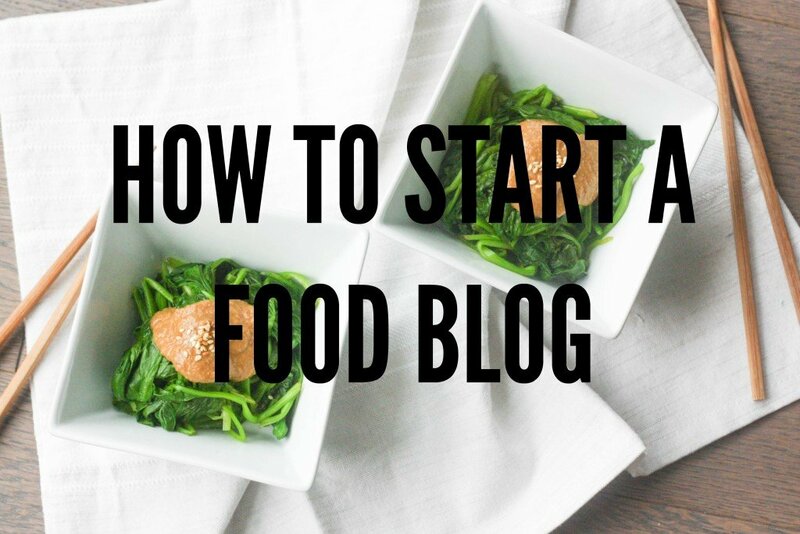 Looking for the perfect appetizer or light lunch? Look no further! 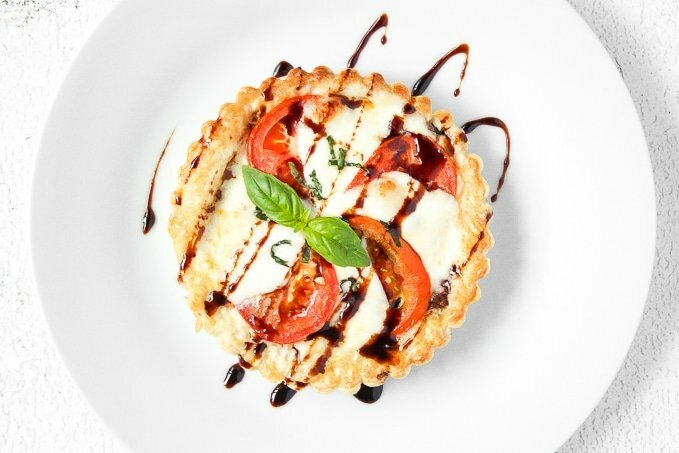 Pair beautiful ripe tomatoes, decadent fresh mozzarella and jammy red onions together with a scatter of basil leaves and a pomegranate molasses drizzle to create what is known in simpler terms as a tomato and mozzarella tart. Just look at that amazing drizzle. The sharp and sweet pomegranate molasses drizzle is what brings this whole dish together. But if you cannot find pomegranate molasses, simply substitute it with a balsamic glaze. You can easily whip one up at home by simply reducing balsamic vinegar to a thick syrup. 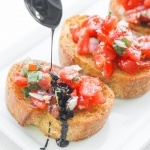 See instructions on my easy tomato bruschetta with balsamic glaze recipe. What the heck is “blind baking”? This recipe may sound a little intimidating for someone who may not be that familiar with such a cooking term. It is a common technique for baking a pie crust or tart without the filling. 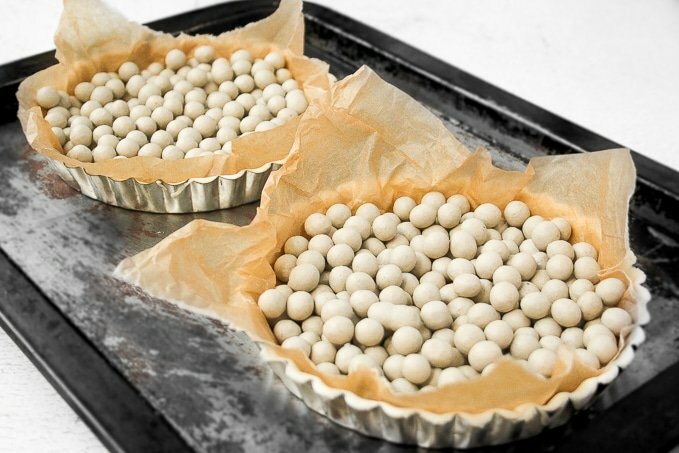 Once you have lined a greased tart tin with pastry dough, all you do is lay over parchment paper and fill with ceramic baking beans. You then “blind bake” in the oven for 5 minutes. Then carefully remove the baking beans and parchment paper and bake for an additional 5 minutes. That’s it! Once you have successfully competed this blind baking process, the world is your oyster! You will want to try out endless tart fillings. So say hello to a life of pies and tarts. I made two medium-sized tarts with this recipe using 6-inch/15 cm tart cases. This is the perfect size for a satisfying lunch. 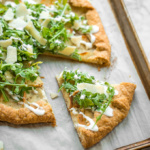 You can also make one large tart or four small ones to serve as appetizers at your next party. 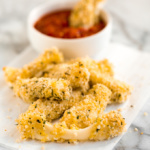 Looking for the perfect appetizer or light lunch? 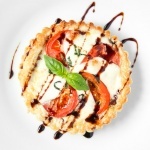 Try a tomato and mozzarella tart topped with basil and a drizzle of pomegranate molasses! Heat the olive oil in a pan and gently cook the red onions and garlic over low-medium heat until softened and caramelised. Add the vinegar to deglaze the pan and cook until all the liquid has evaporated and you are left with jammy, soft onions. In the meantime, roll out the puff pastry and line the greased tart tin(s). Use a fork to pierce holes into the base of the pastry, then lay over parchment paper over and fill with baking beans. Blind bake in the oven for 5 minutes, then carefully remove the baking beans and parchment and bake for an additional 5 minutes. Remove from the oven and spread the jammy red onions into the partially-baked tart cases. 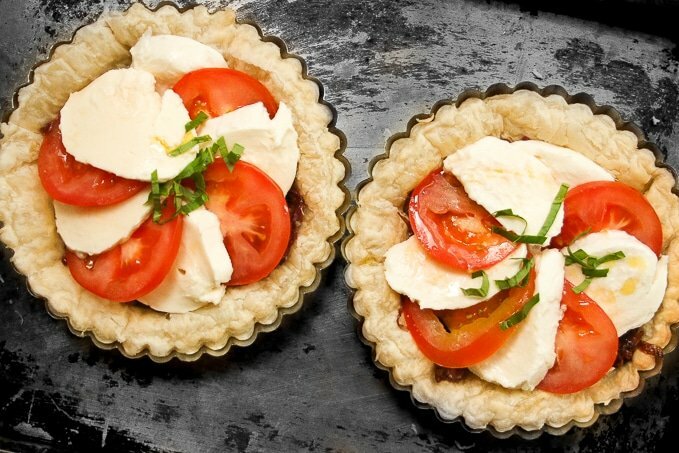 Arrange the sliced tomatoes and mozzarella in the tart in a concentric circle. 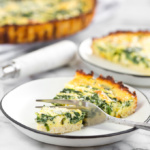 Scatter over some basil leaves and use an egg wash on the rim of the tart. Place back in the oven for 20-25 minutes until the cheese has melted. Remove from the oven and once it is safe enough to handle, carefully remove the tart from the tin and season with sea salt before drizzling with pomegranate molasses. If you cannot find pomegranate molasses, a balsamic glaze will work just as well. You can whip one up at home by simply reducing ½ cup balsamic vinegar to a thick syrup. 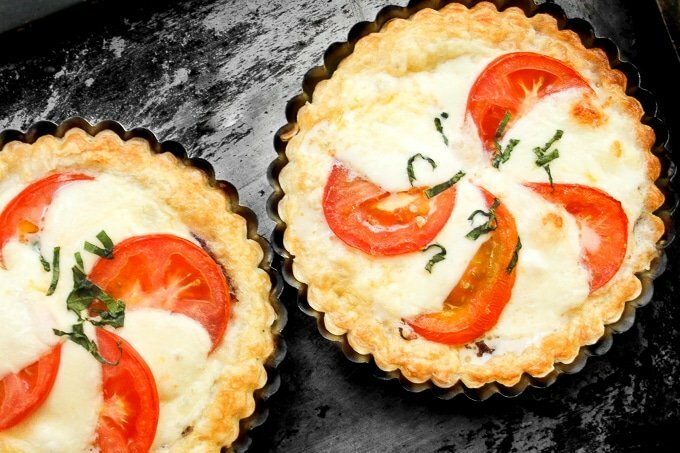 This recipe makes two medium-sized tarts using 6-inch/15 cm tart cases. You can also make one large tart or four small ones. This turned out amazing! Loved the flavors of the carmelized onions on the bottom. So so good!! 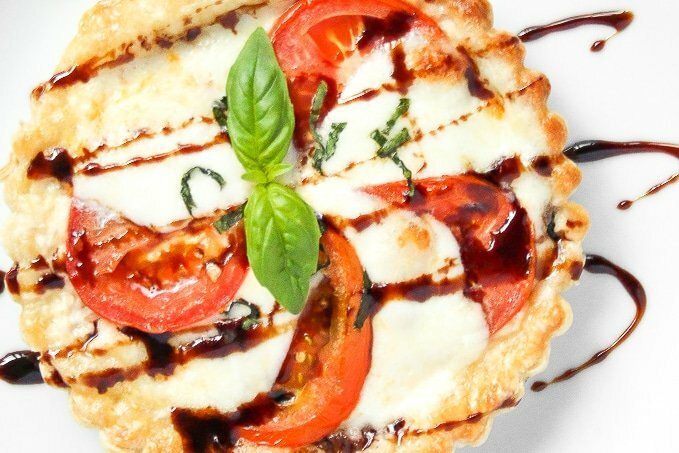 This tomato and mozzarella tart looks so delicious! I can’t wait to make this and devour it. And if my hubby is lucky, he can have a piece. 🙂 Beautiful photos and awesome recipe! 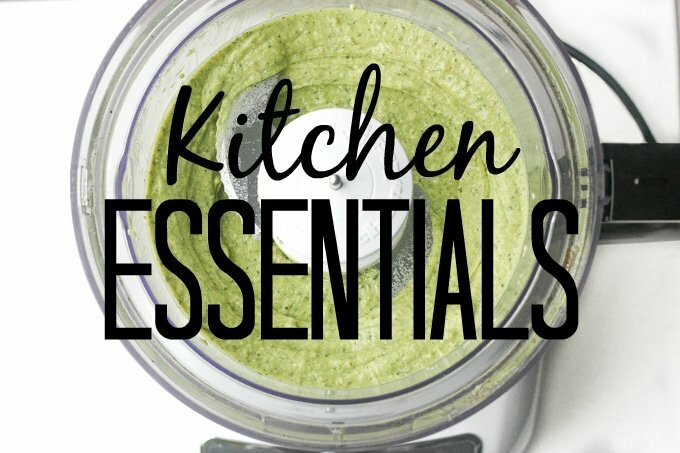 These are such winner recipes in the kitchen! Easy, fast, beautiful and so flavorful! Oh man, this looks amazing! I never knew what “blind baking” meant until now. I feel like I know a secret chef language word now. 🙂 I must try this recipe – it looks so fresh + filling. The perfect summer lunch for sure! I am totally drooling! I want this for lunch today! I can’t wait for my garden tomatoes to ripen. This is the perfect use for them! I have never heard of blind baking..but the tarts look totally drool-worthy! All of my favorites baked in a puff pastry shell. it really doesn’t get any better than THIS! 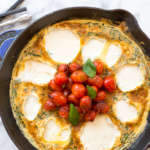 With fresh tomato season just starting and a pot of basil growing in front of my window, I know what I’ll be indulging in quite often this summer! What a pretty and elegant dish! Also a great use for my fresh tomatoes! This looks amazing! It would be great to have as a light lunch!